Apprising Ministries has been covering the developing story of polytheist John Mark Comer, pastor of Solid Rock Church; a multi-site organization that boasts a membership of some 7,000 on a given Sunday. Know this, if you need a qualifier in front of monotheism, then you are not teaching monotheism: In all the universe there is but one true and living God; and there are no others, nor will there ever be (cf. Isaiah 43:10-11). 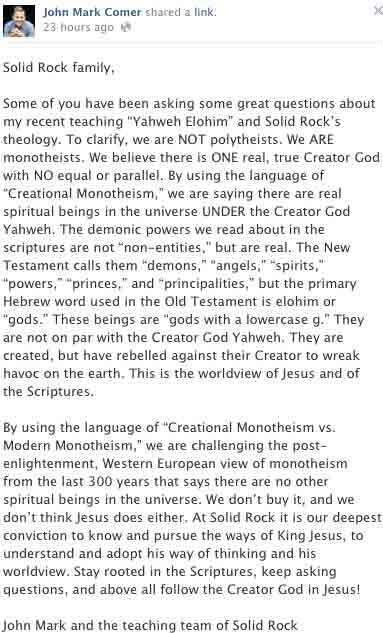 Now here’s John Mark Comer below from his Yahweh Elohim teaching a plurality of gods, not unlike the Mormon mythology of a council of the gods.5 Notice carefully what Comer dreams beginning at 5:51 of this clip. I leave you now with the following from today’s Fighting for the Faith program of Christian apologist Chris Rosebrough who very capably walks you through Comer’s deceptive responses and then calls him to repent.